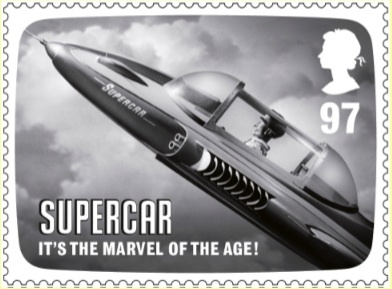 Supermarionation turns 50: Commemorative stamps are go! Happy birthday, Supermarionation! The puppetry technique developed by Gerry and Sylvia Anderson – the term is a combination of the words ‘super’, ‘marionette’ and ‘animation’ – celebrates the 50th anniversary of its first TV broadcast today. 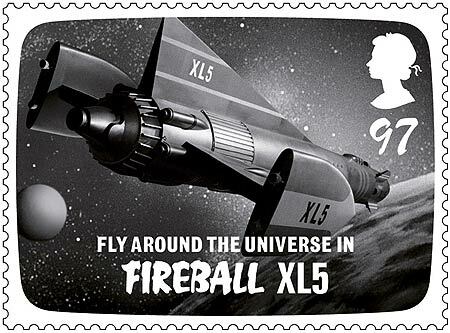 The success of Supercar led to a second series, Fireball XL5 being quickly commissioned. Inspired by Russian cosmonaut Yuri Gagarin‘s achievement of becoming the first man in space just a few months before, this show was based one hundred years into the future. It followed the missions of Colonel Steve Zodiac of the Space City-based World Space Patrol aboard his spacecraft, the titular Fireball XL5, as it patrolled sector 25 of interstellar space. 39 episodes were produced, airing between 1962-63. The Andersons’ next series was their first to be filmed in colour. 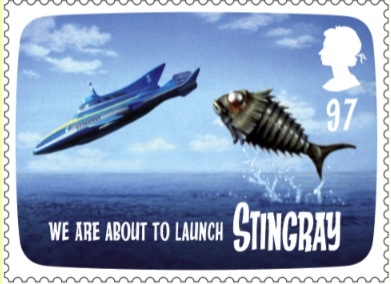 Stingray was a super-fast submarine captained by the dashing Troy Tempest. The show featured pioneering techniques for simulating underwater and on-water scenes. Underwater shots were completed by filming a dry set through a narrow water tank containing fish of various sizes to create the illusion of perspective, while surface scenes were achieved by floating the models in water tanks which were deliberately over-filled to conceal their edges. 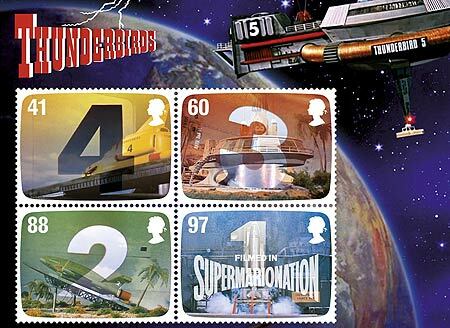 The following year saw the creation of the best-known and most-loved Supermarionation series, Thunderbirds. The Tracy brothers – Scott, Virgil, Alan, Gordon and John – formed International Rescue, a private organisation specialising in dealing with major disasters using their futuristic Thunderbird vehicles. Thunderbird 1 (a rapid response plane and mobile control centre) was piloted by Scott, Thunderbird 2 (equipment transport) by Virgil, Thunderbird 3 (spacecraft) by Alan, Thunderbird 4 (submersible rescue craft) by Gordon and Thunderbird 5 (communications-monitoring space station) was usually manned by John. 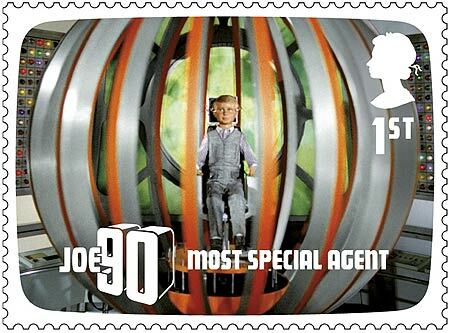 The last pure Supermarionation series – and my personal favourite – was Joe 90. Nine-year old Joe McClaine is a nine-year old schoolboy who doubles as a spy after his father invents a machine – the BIG RAT (Brain Impulse Galvanscope Record And Transfer) – which can record and then transfer knowledge into a human brain. Working as a special agent for the World Intelligence Network (WIN), Joe carries out top secret covert missions which no ordinary agent could manage. Obviously tapping in to the spy-fi genre popularised at the time by the James Bond films and TV series such as The Man From U.N.C.L.E., Joe 90 was more character-focussed than previous Supermarionation series, and much the better for it in my opinion. Finally, there is The Secret Service, a short-lived children’s espionage series. The show featured a hybrid of marionettes and live action shots, the latter being used primarily for long-distance shots. Of course, Supermarionation was an imperfect technique, and fans of the shows will be familiar with its limitations. Characters were generally shown sitting or standing, as they could not convincingly simulate walking. Live-action inserts of actors’ hands would be used to show fine motor actions such as opening a door or pressing a button. And, of course, the wires – though thin – were usually visible, even when camouflaged against a similar-coloured background. Some limitations, however, were addressed over time. For instance, miniaturisation of components allowed the characters’ heads, which were initially disproportionately large in order to accommodate all the necessary electronics, to be made smaller – a change which becomes immediately obvious if you compare Captain Scarlet to, say, Stingray. 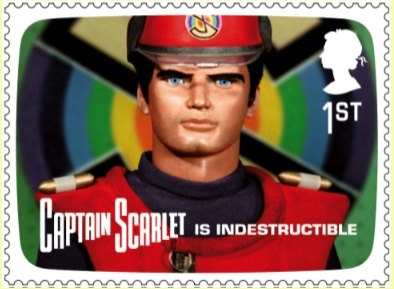 Earlier this month, Royal Mail issued a set of commemorative stamps to mark Supermarionation’s 50th birthday. Seeing them brought back some great memories. As a child, I grew up watching Saturday morning re-runs of Thunderbirds and Joe 90 (and have subsequently had the opportunity to watch all the Supermarionation series other than Four Feather Falls and The Secret Service). And I also had a die-cast model of Thunderbird 2, complete with removable pod containing a tiny plastic replica of Thunderbird 4. Every time I catch an episode of one of the shows on TV, it gives me a lovely warm glow, as I suspect it does to many others of a certain age. In an era in which pretty much anything is possible thanks to the wonders of CGI (including a new series of Captain Scarlet), there is still something quite enchanting about watching a load of jerky puppets with oversized heads dashing about saving mankind. I raise my glass. 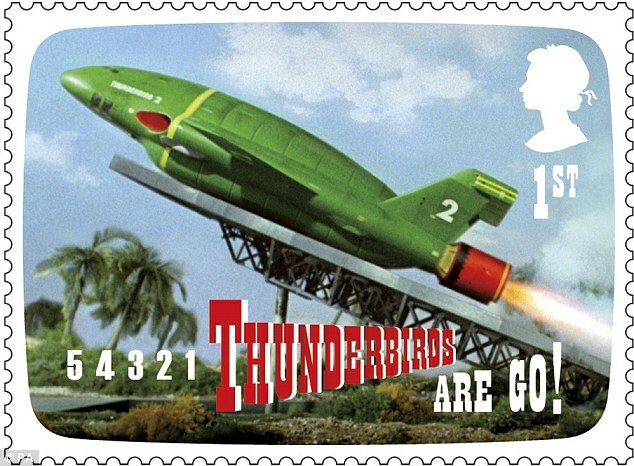 Posted in Entertainment, TV & film and tagged Captain Scarlet, Fireball XL5, Four Feather Falls, Gerry Anderson, Joe 90, stamps, Stingray, Supercar, Supermarionation, Sylvia Anderson, The Secret Service, Thunderbirds. Bookmark the permalink. Happy memories! I loved Thunderbirds when I was a kid and even now smile at the Specsavers advert featuring them. Are you a BlogOn newbie? On the box: Magnum P.I.